Each coin is 1 troy oz. Date of Our Choice as Dealer. 1 - Platinum American Eagle 1 oz. Coin - Date of our Choice. 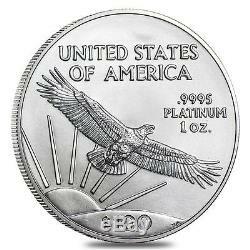 Customers will receive 1 Platinum American Eagle 1 oz. Coin date will be the date of our choice. We do not search the coins. Coins are sometimes perfect and sometimes have small dings, scratches or spots. #14-234, Dana Point, CA 92629. Hours - Nights & Weekends. We try our best to reach each customer in a timely manner. 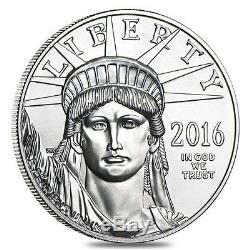 The item "$100 Platinum American Eagle 1 oz Coin US Mint American Eagle Random Year" is in sale since Thursday, April 20, 2017. This item is in the category "Coins & Paper Money\Bullion\Platinum\Coins".coins" and is located in Dana Point, CA.